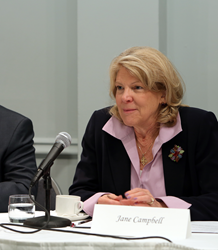 Former Mayor of Cleveland, Jane Campbell, joins National Development Council, a national non-profit with a mission to Increase the flow of capital for investment, jobs and community development to under-served urban and rural areas across the United States. Jane Campbell will serve as Director and Head of National Development Council’s Washington office of Public Policy and Advocacy where she will direct NDC’s newly expanded advocacy campaign, NDC Advocating for Communities Together, or NDC ACT. With NDC ACT as a platform, she will work to raise awareness of the impact of state and federal economic development programs, such as New Markets Tax Credits (NMTC), Low-Income Housing Tax Credits, Small Business Administration lending programs and a host of other federal job creation and community development programs. National Development Council is a comprehensive provider of financing, development expertise, technical assistance and training for community revitalization efforts throughout the country. They also have a nationally recognized Economic Development Professional Training Program that has trained 60,000 economic and community development professionals across the country. NDC has been a leading participant in the New Markets Tax Credit program, receiving $704 Million in allocated funds. They have used that allocation to invest in 87 projects in 23 states. The NMTC investment in those projects has created 14,500 jobs. Their SBA approved small business lending arm, NDC Grow America Fund, is a national leader in small business lending. They have loaned more than $176 million to nearly 490 small business, of which 49% are minority or women-owned. Their lending portfolio has resulted in the creation and retention of more than 13,000 permanent jobs. In 2013, the National Development Council created NDC ACT as an advocacy effort to raise awareness regarding the importance and impact of state funded and federally funded economic development programs. The National Development Council published a policy paper entitled “How Federal Economic Development Tools pay back the Government” which states that funding for federal economic development programs has fallen by 75% as a percentage of GDP. The paper draws the conclusion that programs like NMTC create jobs for local economies and go on to generate an economic return to the federal government through federal income tax collected, thereby paying for themselves in a span of three years. In 2001, Campbell was elected the first woman Mayor of Cleveland, Ohio, where she attracted nearly $3 billion worth of investment capital to redevelopment projects around the city. Recently she served as the Staff Director for the United States Senate Small Business and Entrepreneurship Committee, and has spent her career advocating for Economic and Community Development programs.